Easy Sweet Potato Biscuits: Tender, flaky, whole wheat biscuits made with sweet potato puree are light, fluffy and incredibly moist biscuits. These Sweet Potato Biscuits are perfect for as the base of a savory breakfast sandwich, to serve with a hearty soup, or just to eat with jam. I love bread. I love sweet potatoes. The end. Just kidding. Bread + Sweet Potato Puree= Heaven. NO LIE! I am not going to hide it from you, I am a carb lover. Some may think this is a bad thing. BUT sweet potatoes–full of vitamins and fiber. Whole wheat flour–vitamin A, fiber, whole grains, and protein. Back to the sweet potato biscuits. Can I tell you a secret? You don’t even taste the sweet potato puree in these biscuits. The sweet potato keeps these biscuits moist and tender. Even my husband who is hesitant to say he likes sweet potatoes, LOVES these biscuits. In a food processor fitted with a dough hook, pulse together the flour and baking soda. Add in the cold butter Greek yogurt and pulse a couple times until the butter is broken down into small pea size pieces. 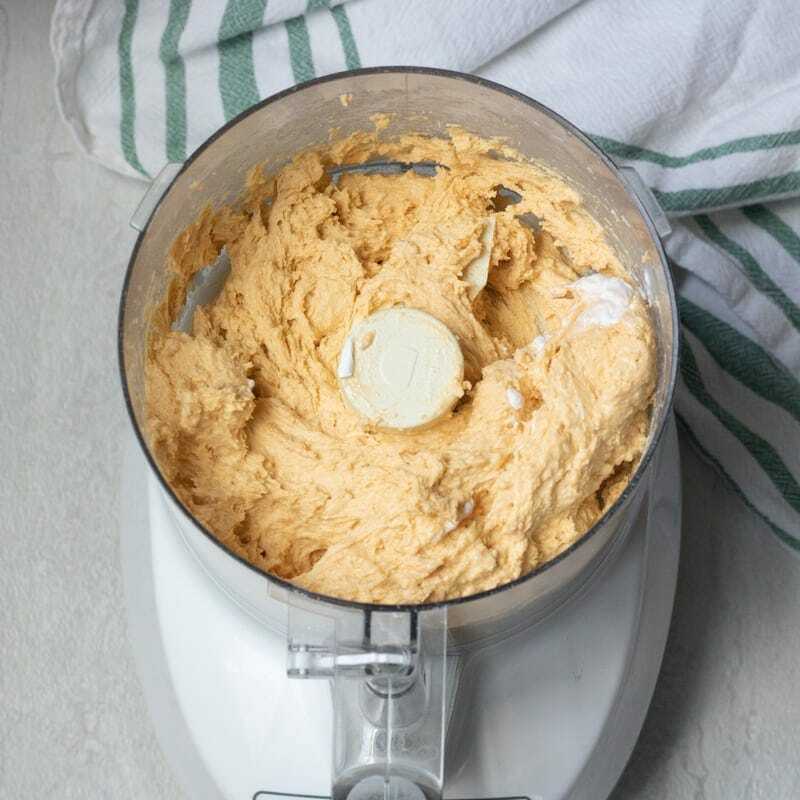 Add in the sweet potato puree and pulse two or three times to distribute the sweet potato through the biscuit dough. Add the buttermilk in tablespoon measurements to the food processor and pulse until the dough just comes together. You may not need all the buttermilk. It is really important your butter, yogurt, buttermilk, and sweet potato puree are very cold in order for the biscuits to stay light and fluffy. Turn out the biscuit dough onto a well floured surface or baking silmat. Using your hands, lightly pat the dough into a ball. Pat the dough down into a 1 inch thick oval. Using a floured circle cookie cutter, cut biscuit dough into circles. Place onto a baking sheet lined with parchment paper or silmat. Brush the biscuits with the extra buttermilk. Use an egg wash to brush on biscuits instead of buttermilk if you do not have egg allergies. Bake biscuits at 400 degrees until puffed up and set. These sweet potato biscuits are PERFECT served in a variety of ways. Dust Sweet Potato Biscuits with cinnamon sugar after baking and serve with butter. Serve with Whole Wheat Sweet Potato Biscuits with pumpkin butter or apple butter. Make a savory breakfast biscuit sandwich with a poached egg and a slice of cheese. Use Sweet Potato Biscuits as the base for a ham sandwich. Serve biscuits with Instant Pot Chili or Black Bean Chili. If you don’t have a food processor, you can make these biscuits by hand, just be careful to not over mix. If whole wheat flour is NOT your thing, use unbleached all purpose flour. These biscuits can be frozen for up to 3 months and left to defrost in fridge overnight or in microwave for 1 minute. If you don’t have buttermilk, use any dairy or non-dairy milk you have or you can make your own buttermilk by adding 1 teaspoon white vinegar or lemon juice to 1 cup milk and let sit for 5 minutes before using. Feel free to shape these biscuits into any shape you like. You can cut into squares, use a pumpkin cooking cutter, or any cookie cutter you like. Light and fluffy biscuits are made with whole wheat flour and studded with sweet potato puree. Fit the food processor with the dough blade (the dull blade). Pulse together the flour, baking powder, and salt together. Add in the butter and pulse until it lookd like peas (see photo). Mix together buttermilk, Greek yogurt, syrup, and sweet potato together. Add to dough and pulse until dough just comes together. Pour dough onto wax paper and pat together and pat down to 1 inch thickness. Use a round 2 inch circle cookie cutter to cut into biscuits. Place onto baking sheet and brush with buttermilk or egg wash if desired. Bake for 12-15 minutes, until browned. Be sure the sweet potato puree has cooled before adding to biscuit mixture--you want the dough to be as cold as possible when it hits the oven--that helps form the tender air pockets in the biscuit. Totally great with a cup of soup! Oh girl, I’d take these biscuits over ones made with regular flour and lard any day! Seen your yummy bisquits on #FoodieFriDIY and just had to pop by and say wow, they look soooo yummy! 😀 Pinned for later!! These look healthy, easy, and really, really delicious! Sounds like a win for me. Plus it’s possible that my son will eat it if it looks like bread. We’re still working our way off the pureed veggies, but he doesn’t seem to be taking to the solid ones 😉 Will have to try! Ha! It took my son FOREVER to eat solid veggies–so I was adding pureed veggies to everything. Oatmeal, smoothies, yogurt, pasta sacuce, tortillas, etc….keep trying, he will get it one day! Thanks for sharing on Creative K Kids’ Tasty Tuesdays I have pinned this to our tasty Tuesday’s Pinterest Board. YUM! These would be fabulous with some honey butter! Great idea! I could eat those any time of day…they look delicious, Kristen! Thanks Michelle! I love them! Sweet potato biscuits? Never thought of that! Fantastic idea and what a vibrant color! The color is beautiful. And the sweet potatoes also give an incredible flavor to these biscuits. These sweet potato biscuits look like the perfect snack! Love finding new recipes like this! The sweet potato adds just the right touch.